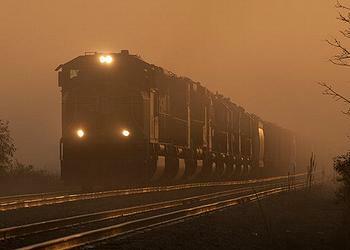 HOXIE, Arkansas, August 17, 2014 (ENS) – Two Union Pacific Railroad train crew members have died and two others were hurt when two freight trains collided head-on in northeast Arkansas early Sunday morning, according to Arkansas State Police. At approximately 3 am, Arkansas State Troopers were notified of the collision in the Lawrence County town of Hoxie, about 90 miles northwest of Memphis, Tennessee. Union Pacific Railroad officials said both trains were carrying toxic chemical cargo. As a precautionary measure about 500 Hoxie residents within 1.5 miles of the collision were evacuated to the Walnut Ridge Community Center. A fire involving one of the train engines took seven hours to extinguish but did not threaten any of the toxic cargo. “The fire involved diesel and also there was a tank car that ruptured and it contained an alcoholic beverage,” Arkansas Department of Emergency Management spokesman Kendell Snyder told reporters. All highways leading into Hoxie were blocked by Arkansas State Police and local law enforcement personnel. Some roads are now open, but Highway 67 south of Highway 63 and Highway 67 at the intersection with Highway 230 will remain blocked for up to three days while railroad crews remove wreckage. Highway 91 remains open as an alternate route for motorists traveling to Walnut Ridge and the Hoxie area. Most of the evacuees were allowed to return by noon Sunday, according to county emergency management officials. The fatal incident comes just three days after Union Pacific boasted on its website that the railroad achieved a record low 2.95 reportable rail equipment incident rate for the first half of the year through June 30, a four percent improvement over the same period in 2013. Michael Hiller, an investigator for the National Transportation Safety Board, told The Associated Press that the collision involved a train with two locomotives and 86 cars and another with two locomotives and 92 cars. The first train was northbound on a single main track when the second train, which was southbound, collided with it, he said. Hiller said they were operating on the same track. The cause of the accident is under investigation. WASHINGTON, DC, August 18, 2014 (ENS) – The U.S. Energy Department has announced more than $55 million for 31 new projects to accelerate research and development of critical vehicle technologies that will improve fuel efficiency and reduce costs. The biggest chunk of this round of government funding goes to Delphi Automotive Systems, the Troy, Michigan branch of this British company, for two projects. Delphi will receive $10 million to develop a low temperature combustion technology called gasoline direct injection compression ignition that provides high thermal efficiency with low emissions of nitrogen oxides and particulate matter. Delphi will get a separate grant of $2.53 million to develop a total thermal management solution for electric vehicles using a compact refrigerant loop, a coolant­based thermal energy distribution network and waste heat harvesting from the power electronics. 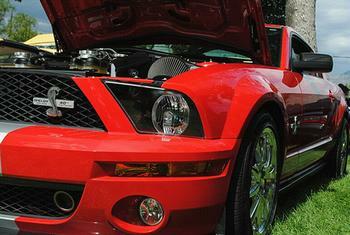 Ford will receive the next largest investment for two of its projects. First, the automaker will get $6 million to develop, integrate and implement predictive models for carbon fiber reinforced polymer composites that link the material design and molding process with final performance. Ford will also get $1.3 million to demonstrate new low temperature catalyst materials that are durable enough to meet full useful life emissions targets while minimizing fuel economy penalties and costs. This round of funding is part of the Obama Administration’s push to reduce dependence on oil imports and transition to a clean energy economy. “Investments in the next generation of vehicle technologies will both strengthen our economy and lead to a more fuel efficient, clean energy future,” said U.S. Energy Secretary Ernest Moniz. “Improving vehicle efficiency is instrumental to establishing a 21st century transportation sector that creates jobs as well as protects future generations from harmful carbon emissions,” said Moniz. The U.S. Army is contributing a total of $3.7 million over two fiscal years in co­funding to support projects focused on beyond lithium ion battery technologies and reducing friction and wear in the powertrain. The Army will also test and evaluate fuel-efficient tires resulting from projects at its facilities in Warren, Michigan. “Partnering with the Energy Department, we are accelerating the development and deployment of cutting-edge technologies that will strengthen our military, economy, and energy security,” said Dr. Paul Rogers, director the U.S. Army Tank Automotive Research, Development and Engineering Center. Nineteen of the projects are aimed at reducing the cost and improving the performance of key components for plug-in electric vehicles. This includes improving “beyond lithium ion technologies” that use higher energy storage materials, and developing and commercializing wide bandgap semiconductors that offer advances in performance while reducing the price of vehicle power electronics. Twelve projects are aimed at developing and demonstrating dual-fuel/bi-fuel technologies to reduce petroleum usage, accelerating growth in high-efficiency, cost-competitive engine and powertrain systems for light-duty vehicles, and accelerating the introduction of advanced lubricants and coatings to increase the efficiency of future vehicles. The complete list of awardees is online here. AUSTIN, Texas, August 17, 2014 (ENS) – Hormel Foods Corporation, a company that has been making bacon for over 100 years, has now made the world’s first motorcycle fueled by bacon grease. The Austin-based company has created a new marketing campaign in time for the International Bacon Film Festival in San Diego, California, which takes place August 29. Hormel and marketing firm BBDO Minneapolis sponsored a motorcycle that runs on organic biodiesel made of refined bacon grease, which traveled from Austin to California this month. A team of 12 traveled with rider Eric Pierson, a Minneapolis actor. They filmed the journey for the film, “Driven By Bacon,” which will be shown at the film festival this year. The “Driven By Bacon” team worked with Bio-Blend Fuels in Manitowoc, Wisconsin to refine bacon grease into 100 percent biodiesel, an environmentally-safer alternative to conventional diesel fuel. Bio-Blend turned about 275 gallons of bacon grease into 250 gallons of B100 bacon biodiesel for the project. Sadly, in January 2014 Bio-Blend Fuels, a small boutique biodiesel plant, permanently shut down all fuel production, citing uncertainty over the U.S. governments Renewable Fuel Standard requirements for 2014. “Changes in industry regulations have made it increasingly more difficult for a small plant to compete with large scale commercial plants,” said owners Dan and Tracy Kaderabek. But the bacon biodiesel they made for the “Driven By Bacon” campaign is nearly carbon-neutral, contributing almost no emissions to global warming. And the exhaust emission smells like bacon! The Black Label Bacon Bike was rebuilt from a diesel motorcycle from the Netherlands, the Track T-800CDI, with a touring motorcycle body style, one of only 20 ever made. Mechanical engineer and “bacon fiend” Charlie Smithson stripped the bike down to its core and remade it as a café racer inspired, bacon-powered machine. The Track T-800CDI has an 800 cc three-cylinder CDI common rail turbo diesel engine developed by Mercedes especially for the motorcycle. Manufactured by EVA Products BV, it gets 100 miles per gallon and can go from zero to 60 mph in six seconds. 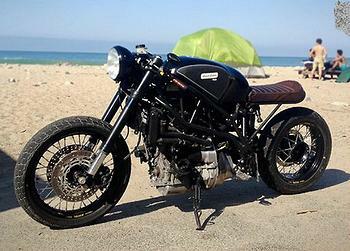 Pierson pulled the Bacon Bike up on the beach at San Diego, California on Tuesday. Hormel reps say the “Driven By Bacon” marketing campaign is a great way to publicize Hormel’s Black Label Bacon brand and the motorcycle will be used as a promotional tool in the future. SACRAMENTO, California, August 17, 2014 (ENS) – The U.S. Fish and Wildlife Service Thursday proposed to protect more than a half-million acres of critical habitat across the West for the yellow-billed cuckoo, a songbird that lives along rivers and streams. The new proposal would protect 546,335 acres of stream side habitat in nine western states: Arizona, California, Colorado, Idaho, Nevada, New Mexico, Texas, Utah and Wyoming. The yellow-billed cuckoo was proposed for Endangered Species Act protection in October 2013 as part of a 2011 agreement with the nonprofit Center for Biological Diversity to speed protection decisions for 757 imperiled species nationwide. “This is an important victory not just for yellow-billed cuckoos but for rivers and streams across the West,” said Michael Robinson, a conservation advocate at the Center, which first petitioned for the cuckoo’s protection in 1998. 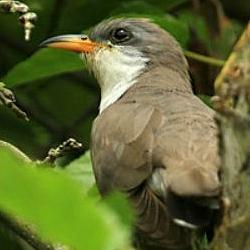 The yellow-billed cuckoo was identified as being in need of federal protection in 1986. It once thrived along nearly every water body in the West, but has since vanished due to dams, livestock grazing, water withdrawals and river channelization. Today it survives in very small numbers near parts of the Sacramento, Eel and Kern rivers in California; the Colorado, Gila, Verde and San Pedro rivers in Arizona; the Gila and Rio Grande rivers in New Mexico; and scattered locations in Colorado, Idaho, Nevada, Texas, Wyoming and Utah. The bird’s Endangered Species Act protection is expected to be finalized in October, and the proposed critical habitat designation should be finalized in October 2015. Critical habitat protection will require any federally funded or permitted projects that could harm the cuckoo’s habitat to consult with the Fish and Wildlife Service to ensure that the habitat is not harmed. Robinson says that species with protected critical habitat are more than twice as likely to recover compared to those without such protected habitat. WASHINGTON, DC, August 17, 2014 (ENS) – U.S. Fish and Wildlife Service Director Dan Ashe is withdrawing a proposal to list the North American wolverine in the lower 48 states as a threatened species under the Endangered Species Act. The Service initially proposed to list the wolverine based on climate change model forecasts showing overall loss of spring snow across the range of the species. However, said Ashe, upon conducting a more thorough review and gathering additional information, the Service found that climate change models are unable to reliably predict snowfall amounts and snow cover persistence in wolverine denning locations. The wolverine, a large, elusive member of the weasel family found in the Mountain West, has made a steady recovery in the past half century after hunting, trapping and poisoning nearly extirpated the species from these states in the early 1900s, the agency has determined. “Climate change is a reality, the consequences of which the Service deals with on a daily basis,” said Ashe. “While impacts to many species are clear and measurable, for others the consequences of a warming planet are less certain. This is particularly true in the Mountain West, where differences in elevation and topography make fine-scale prediction of climate impacts ambiguous,” he said. 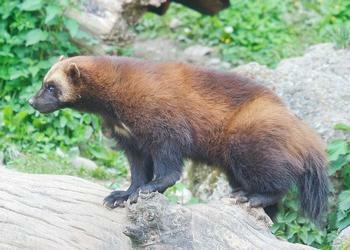 “In this case, based on all the information available, we simply do not know enough about the ecology of the wolverine and when or how it will be affected by a changing climate to conclude at this time that it is likely to be in danger of extinction within the foreseeable future,” Ashe said. As a result, the wolverine does not meet the statutory definition of either a “threatened species” or an “endangered species” and does not warrant protection under the Endangered Species Act. The estimated 250 to 300 remaining wolverines in the lower 48 states face severe threats from global warming, which is shrinking the spring snowpack they need for building sheltered dens to raise their young. Global warming over the next 75 years is projected to wipe out 63 percent of the snowy habitat they need to survive, said Greenwald. Ashe says his decision to withdraw the listing proposal was backed by the consensus recommendation of the agency’s three regional directors for the agency’s Western regions. Wolverines currently occur in the North Cascades Range in Washington and the Northern Rockies of Montana, Idaho, Wyoming and a small portion of Oregon in the Wallowa Range. Wolverine populations once existed in the Sierra Nevada of California and the southern Rocky Mountains in Colorado, Wyoming and New Mexico. DENVER, Colorado, August 17, 2014 (ENS) – Christopher Loncarich, 55, of Mack, Colorado, pleaded guilty in federal court in Denver to a felony conspiracy charge stemming from his sale of outfitting services for illegal mountain lion and bobcat hunts in Colorado and Utah, the Justice Department said Friday. Loncarich pleaded guilty to one count of conspiracy to violate the Lacey Act, a federal law that makes it illegal to knowingly transport or sell in interstate commerce any wildlife that has been taken or possessed in violation of state laws. According to an indictment returned by the grand jury for the District of Colorado on January 7, and the plea agreement, Loncarich conspired with others to provide numerous illegal hunts of mountain lions and bobcats in Colorado and Utah from 2007 to 2010. Loncarich and his confederates trapped, shot and caged mountain lions and bobcats prior to hunts in order to provide easier chases of the cats for clients. Loncarich also admits that he and his assistants guided several hunters who did not possess a Utah mountain lion or bobcat license on mountain lion or bobcat hunts in Utah. Loncarich’s base of operations in Mack, Colorado, is about five miles from the Utah-Colorado border. Loncarich sold mountain lion hunts for between $3,500 and $7,500 and bobcat hunts for between $700 and $1,500 and shared a portion of the proceeds from successful hunts with his assistant guides. Three of Loncarich’s assistant guides have previously pleaded guilty to Lacey Act violations in connection with their guiding activities with Loncarich. The maximum penalty for conspiring to violate the Lacey Act is five years in prison and a $250,000 fine. Under the terms of the plea agreement, the prosecution agreed to a sentencing calculation pursuant to the advisory United States Sentencing Guidelines but did not agree on a term of imprisonment, an amount of fines or an amount of restitution. A sentencing hearing for Loncarich is set for November 20. The case was investigated by the U.S. Fish & Wildlife Service, Colorado Parks and Wildlife and the Utah Division of Wildlife Resources. The case is being prosecuted by the Environmental Crimes Section of the Justice Department’s Environment and Natural Resources Division. 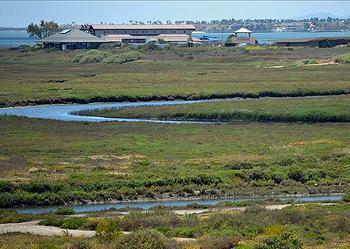 SAN DIEGO, California, August 17, 2014 (ENS) – The San Diego National Wildlife Refuge Complex will receive an additional $1 million in funding to reach new audiences and engage Southern California urban communities and youth in conservation and outdoor recreation. The refuge is the first among the nation’s urban national wildlife refuges to receive this new award through a nationwide competition. “From teaching urban youth about the magnificence of the California condor to unlocking opportunities to explore nature along the Los Angeles River, the San Diego National Wildlife Refuge Complex is a model of how we can leverage innovative partnerships to connect new and diverse audiences to the great outdoors,” said Secretary of the Interior Sally Jewell, announcing the award Wednesday. “This dedicated funding will help engage the next generation of conservationists while also strengthening connections between the community and these public lands that belong to all Americans,” she said. The refuge’s winning proposal, the SoCal Urban Wildlife Refuge Project, incorporates outdoor learning, service and stewardship of natural habitats, and conservation-based projects for youth and young adults from diverse communities. It encompasses activities not only at the San Diego Refuges but also to the north at the Hopper Mountain National Wildlife Refuge Complex and in Los Angeles under the auspices of the Los Angeles Urban Wildlife Refuge Partnership and Friends of the Los Angeles River. Ten exceptional programs have been incorporated into the SoCal Project that will complement and expand current outreach and education programs on the refuges. One program works with the Los Angeles Conservation Corps to develop job skills with inner city, low-income young adults to restore wildlife habitats along the Los Angeles River and to lead outdoor education activities. Another expands the partnership with Earth Discovery Institute to build a cadre of young technology-savvy environmental stewards and to expand service opportunities for volunteers and communities to connect with their wild lands. Yet another trains teachers and students on the use of cutting-edge science to solve conservation problems with the San Diego Zoo Institute for Conservation Research. Ashe launched the competition in March to encourage innovative proposals from refuges across the country to engage new and diverse audiences.